Brain Injury Australia’s charity partner, Sidetember – a “fun initiative running in the month formerly known as September to help raise funds for people living with a brain injury” – has decided to double its support for Return2Sport to $20,000. 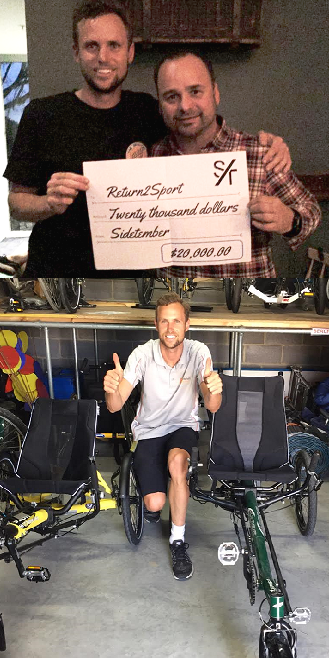 The donation will go, in part, to help purchase new recumbent bicycles, pictured below with Return2Sport Coordinator, Sebastian van Veenendaal. Also pictured, Sidetember founder and organiser, Stuart Matthewman, presenting the $20,000 donation to Seb. Sidetember is back in 2017, bigger (going national!) and better (in partnership with Brain Injury Australia, and Royal Rehab). Find out more in future newsletters.